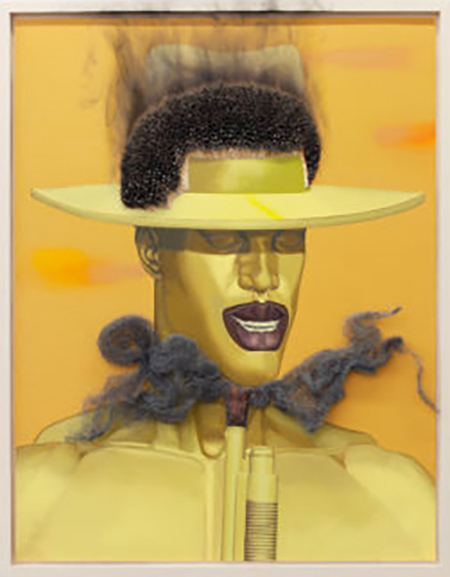 Jeff Sonhouse, "Repeat Offender," 2018, oil paint, wood matches, copper and steel wool on panel in artist's frame, 37 3/4 x 29 1/2"
Jeff Sonhouse’s “Entrapment” features two galleries worth of portraits depicting African American men. With a masterfully realistic hand, the New York-based artist creates compositions that are subtly surreal — enough so as to make us wonder, while still keeping one foot in reality. In works like “Grafted Populist,” a harlequin pattern covers the figure’s face and neck like a tightly drawn mask, leaving his mouth and chest bare. This patterned masking recurs throughout many of the works: a veneer that maintains even as it hides the likeness of the man behind it. Sonhouse’s paintings emanate ambiguity, though the artist’s material choices give us a glimpse of what these subjects’ narratives might be. In particular, the use of matches affixed atop the oil paint in several pieces heightens the emotional content of these otherwise stoic portraits. Layers of matches have been applied as the figures’ hair, and then lit. With charred matchsticks and smoke stains, and steady, calm expressions, the works simultaneously embody trauma and strength.